Background: Ideal treatment for warts should be effective, safe, have less morbidity and provide long-lasting immunity against human papilloma virus. This can optimally achieved by the stimulation of the immune system against the virus. The autoimplantation of warts, autowart injection and quadrivalent vaccines have been used for this purpose. Autoimplanatation is a simple technique where the subcutis deep wart tissue is harvested as a donor and implanted into the uninvolved skin. However, this led to two wounds, at donor and recipient sites. Aim: The aim was to evaluate the safety and efficacy of a novel modification of autoimplantation therapy in the treatment of multiple, recurrent and palmoplantar warts. 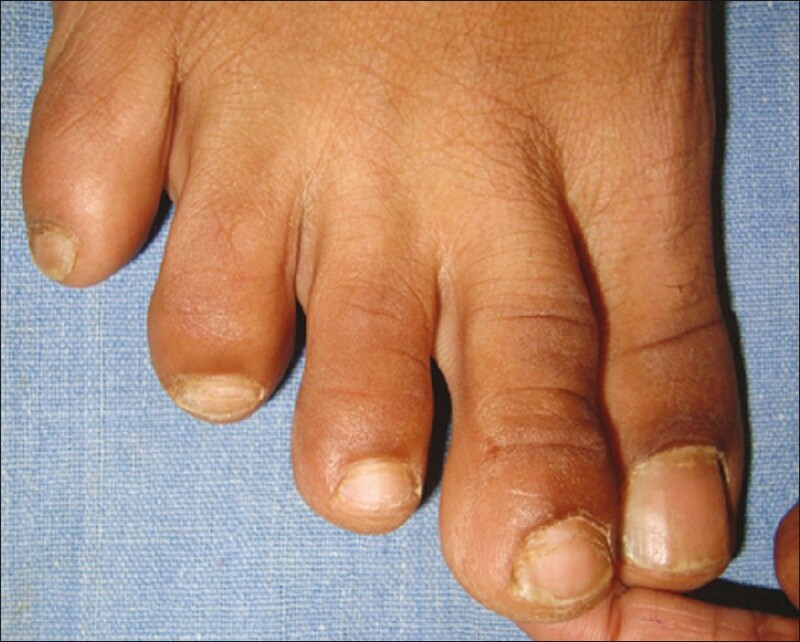 Subjects and Methods: Thirty-three patients with multiple, recurrent and palmoplantar warts were enrolled. Instead of taking a bit of the wart tissue, the donor tissue was harvested by paring the wart. The pared tissue was implanted deep into the subcutis by stab incision done using the same surgical blade no. 11. The resolution of all warts within 3 months after the procedure was considered successful. Patients with complete clearance were followed up for 1 month for any recurrence. Results: Out of 35 patients, 27 patients were available for follow-up. A total of 20 (74.1%) patients showed a complete clearance of warts within 3 months. Partial clearance was seen in 1 patient. Erythematous nodules developed at the site of implantation in 3 (11.1%) patients. There was relapse in one patient. Conclusion: A modified technique of autoimplantation of warts employing the pared stratum corneum tissue from the wart is a simple, effective, less traumatic and rapid procedure in the treatment of multiple, recurrent and palmoplantar warts. Warts are mucocutaneous growths (exo- or endophytic) caused by human papilloma virus (HPV). Common therapeutic modalities ablate the growth without the generation of specific immunity against the wart. This often leads to irritation, pain, recurrence, scars, and prolonged morbidity (especially in palmoplantar warts). The stimulation of the immune system by exposing the virus to immune mediators forms an ideal modality of treatment due to spontaneous regression of the wart with long-lasting immunity. A quadrivalent HPV vaccine has been reported to cause wart regression. However, serotypes other than those in vaccine (HPV 6, 11, 16 and 18) also cause warts and hence this modality may not be effective always. Autoimplantation is a novel, one-time procedure which treats the warts by stimulating an immune response against HPV. As it is an autograft technique, it is more likely that immunity against the same serotype is elicited (in contrast to the HPV vaccine where immunity is developed only against HPV 6, 11, 16 and 18). This is done by extracting a subcutis deep wart tissue and implanting it into the uninvolved skin. , This leads to wound at two sites and more discomfort and risks infection. The autowart injection involves multiple sessions of injection of wart suspension. In this study, we extracted the donor tissue by paring the wart instead of removing a part of the wart under local anaesthesia. This was adopted to reduce the discomfort, risk of infection and hasten the time taken for performing the procedure. This study was conducted in the dermatology outpatient department of a tertiary care rural hospital. Thirty-five patients with multiple (more than five warts), recurrent verruca vulgaris (warts which have recurred after any modality of treatment) and palmoplantar warts were enrolled in the study after an informed consent and ethics committee approval. Pregnant, lactating mothers, immunocompromised individuals and those with verruca plana were excluded from study. 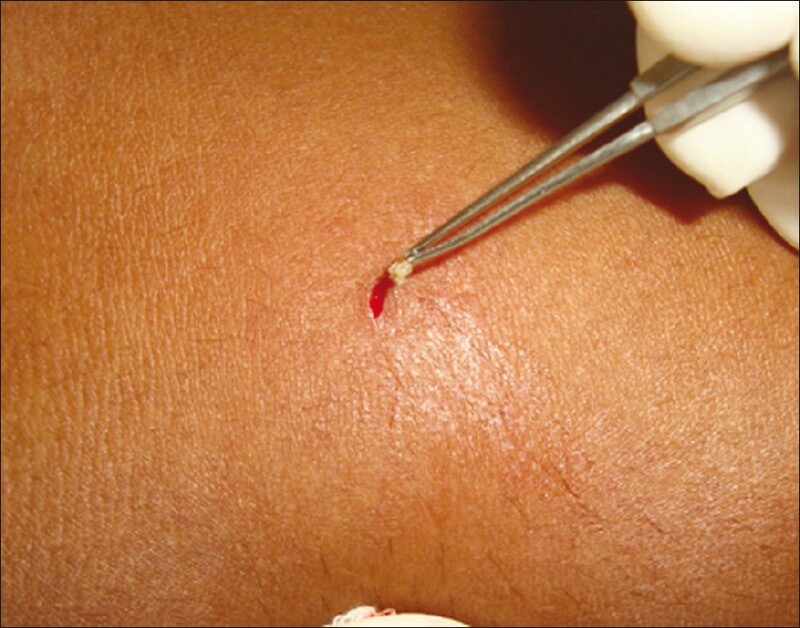 Donor tissue for autograft was harvested by paring a verrucous lesion or a palmoplantar wart. The lesion to be pared was cleansed with spirit-povidone iodine-spirit to achieve asepsis. Paring was done using a sterile surgical blade no. 11 [Figure 1]. The pared tissue was transferred onto the sterile surgical gauze. Autografting was done either on the non-dominant flexural forearm or the upper anteromedial thigh. The site for engraftment was cleansed with spirit-povidone iodine-spirit and infiltrated with about 0.5 ml of lignocaine with adrenaline (1:200,000). A subcutis deep stab incision of about 3-5 mm was made using the same surgical blade of no. 11 used for paring the wart [Figure 2]. The pared tissue was introduced deep into the subcutis using Adson's forceps or an insulin syringe used for infiltration [Figure 3]. The margins of the wound were approximated by pressure and a micropore plaster was applied on it. Patients were advised not to wet or remove the plaster for 5 days. Patients were put on systemic antibiotics for 5 days (tab. amoxycillin 500 mg + clavulanic acid 125 mg, BID) and if required, analgesics orally. Patients were assessed monthly, and resolution of all warts within 3 months was taken as complete clearance. Patients were followed up for one more month after clearance for any recurrence. Out of 35 patients, 8 were lost to follow-up and 27 patients were available for evaluation. Most of the study patients were males (16 patients, 59.2%). The commonest age group affected was that of 20-40 years (13 patients, 48.1%). Ten patients had multiple lesions, 7 had recurrent and 10 had palmoplantar warts. A total of 20 (74.1%) patients showed the resolution of the warts within 3 months [Figure 4] and [Figure 5], 5 (18.5%) patients had no improvement at all [Table 1] and in 1 patient (3.7%; male, 17 years of age) with multiple warts, except one lesion, others had resolved completely. One (3.7%) male patient aged 16 years had relapse, with a new lesion occurring at a different site. He underwent autoimplantation of the new wart, which healed over a period of 1 month. One of the patients developed hypopigmentation at the site of resolution of warts. Three (11.1%) patients developed erythematous tender nodules at the site of engraftment, with a purulent discharge from them in one patient. However, this healed with systemic antibiotics and analgesics with mild transient hyperpigmentation. Warts are one of the common viral infections of the mucocutaneous surfaces and often induce papillomatous growth. 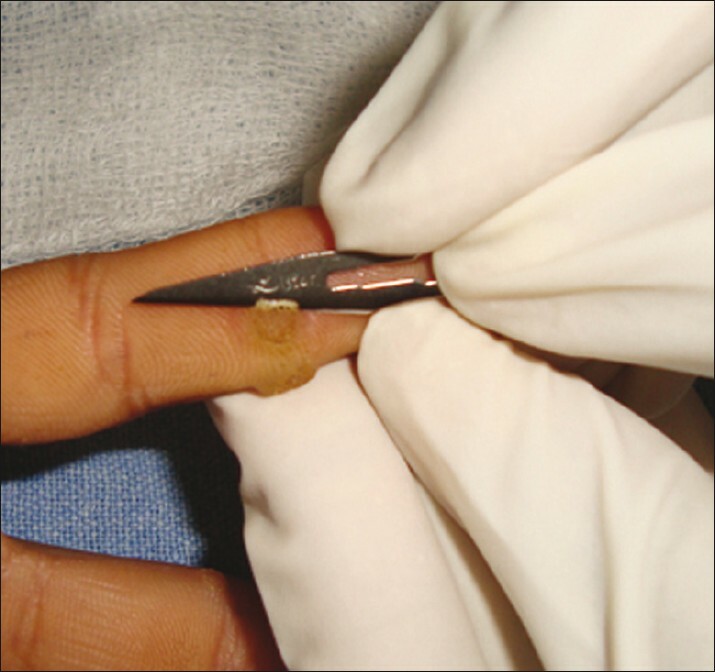 The commonest modality of treatment for warts is ablation using electrocautery, radiofrequency, laser or cryogens. These treatments destroy the wart-containing tissue but may not stimulate the immune system against the pathogen. Hence, for the effective treatment of warts, there should be immune stimulation which can lead to long-term immunity against HPV. In their study on the autoimplantation technique, Shivakumar et al. extracted a subcutis deep part of the wart using a 18 G needle and implanted it into the skin elsewhere. This resulted in two wounds. Also, HPV is an epidermal infection and there is no added advantage with the extracting donor tissue containing dermis and subcutis. Hence, in this study, we harvested the donor by paring the wart to get the stratum corneum tissue containing virus. By this method, we avoided wound at the donor site and also circumvented the issue of taking the unwanted deeper tissues for engraftment. In contrast to the autowart injection therapy, this is a single sitting procedure and avoids the risk of injection abscess. Most of our patients were males and belonged to the 20- to 40-year age group in parlance with other studies. A complete clearance of warts was observed in 74.1% of patients [Table 2], greater than that observed by Usman et al. (44%) or Shivakumar et al. (73.3%). Autowart injections also had lesser clearance than our study. We had one patient with multiple warts in whom one of the warts persisted at the end of 3 months. Partial clearance was not observed by Usman et al. or Shivakumar et al. Non-responders were minimal in the study, using autowart injection, by Srivastava et al. But they had a high percentage (22.64%) of partial clearance patients. One of our patients had clearance of warts after autoimplantation but developed a new lesion at a new site. This observation has not been reported by other researchers. This probably could be due to infection by a different serotype of HPV. As we were unable to isolate the species of HPV, this inference is hypothetical. We did autoimplantation of the new wart and it healed in over 1 month. This further supports the hypothesis. In one patient, warts healed with transient hypopigmentation. Of the 27 patients, only 2 had anogenital warts in addition to verruca vulgaris and these also cleared completely with the autoimplantation of warts. Hence, the final outcome was much better in our study (74.1%) when compared with other autoimplantation as well as autowart injection techniques (44-73.3%). Reaction at the site of engraftment in the form of erythematous tender nodules was observed in three patients, with a purulent discharge in one from the nodules. However, these subsided with systemic antibiotics and healed with post-inflammatory hyperpigmentation. Shivakumar et al. also noticed reactions at the injection site in some patients but have not disclosed the exact number. Other researchers of the autoimplantation or autowart injection technique have not commented on any such reactions. This could be due to intense inflammation caused by implanted squames which act as a foreign body in the dermis and subcutis analogous to an inflammatory reaction which occurs in the case of a ruptured follicle. Limitations of our study include a small sample size, lack of controls to assess spontaneous resolution of warts and lack of serotyping of persistent warts or checking for serospecific HPV antibodies. We also need to study the cause for the partial clearance or occurrence of new warts in spite of the clearance of all previous warts. The modified technique of autoimplantation using the pared stratum corneum tissue of the wart instead of the subcutis deep wart tissue for autografting is a safe, efficacious, less traumatic and rapid procedure for the treatment of multiple, recurrent and palmoplantar warts. This technique also scores over the autowart injection method of treatment. 1. Venugopal SS, Murrell DF. Recalcitrant cutaneous warts treated with recombinant quadrivalent human papilloma virus vaccine (types 6, 11, 16, and 18) in a developmentally delayed, 31-year-old white man. Arch Dermatol 2010;146:475-7. 2. Kreuter A, Waterboer T, Wieland U. Regression of cutaneous warts in a patient with WILD syndrome following recombinant quadrivalent human papilloma virus vaccination. Arch Dermatol 2010;146:1196-7. 3. Shivakumar V, Okade R, Rajkumar V. Autoimplantation therapy for multiple warts. Indian J Dermatol Venereol Leprol 2009;75:593-5. 4. Usman N, Udayashankar K, Subramanian S, Thyagarajan SP. Autoimplantation technique in the treatment of anogenital warts: A clinic-immunological study. Int J STD AIDS 1996;7:55-7. 5. Srivastava PK, Bajaj AK. Autowart injection therapy for recalcitrant warts. Indian J Dermatol 2010;55:367-9. 6. Viac J, Thivolet J, Chardonnet Y. Specific immunity in patients suffering from recurring warts before and after repetitive intradermal tests with human papilloma virus. Br J Dermatol 1977;97:365-70. 7. Briggaman RA, Wheeler CE Jr. Immunology of human warts. J Am Acad Dermatol 1979;1:297-304.